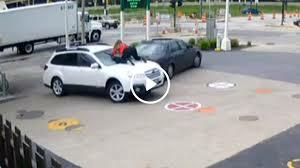 Video: Woman jumps on moving car to battle off car thieves – Royal Times of Nigeria. Melissa Smith, 27, became a viral sensation when a video of her preventing car jackers from making away with her car hit the internet on Friday. Melissa, according to Independent UK, was printing her receipt at a petrol station in Milwaukee when a stranger jumped into her car and began driving away. ‘I had my, ‘Oh no this isn’t happening to me today moment,’’ she told local news station WISN 12. The saleswoman leapt onto the hood of the moving car, banging her hands on the windshield. She stayed planted there as the thief drove toward the street, slamming on the brakes and turning on the windshield wipers in an attempt to throw her off. Smith said she could hear him laughing from inside the car. The would-be carjacker eventually jumped out of the vehicle, grabbing Smith’s purse and phone as he left. The young woman then chased her still-moving car into the street, jumping into the driver’s seat before it could hit anyone. Surveillance footage of the incident made its way online, where viewers called Smith everything from ‘crazy’ to a ‘hero’. She quickly booked interviews on local news stations, as well as CNN and ABC. Police are still looking for suspects in the robbery. This post first appeared on NEWSROOM.